The way I was raised, UTVs were the devil's replacement for horses. 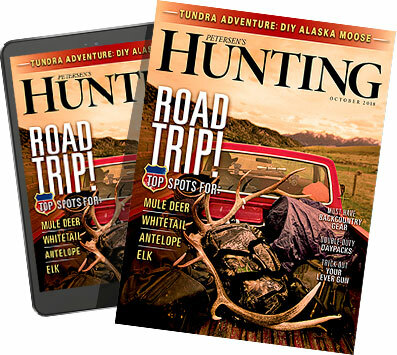 Noisy, smelly, hard on the landscape, and, most of all, fool-makers of the would-be hunters that used them to access the backcountry, UTVs and those that rode them were the bane of horse-packing and backpacking hunters. But middle age caught up with me, and my situation changed and no longer enabled me to own horses. I've come around. Don't get me wrong. When they're utilized in reckless fashion, I still consider UTVs Beelzebub's toys and their riders his minions. However, while costly up front, a good UTV doesn't require a corral and a stable or the feeding of expensive hay through the winter. It doesn't have to be trained or exercised regularly to remain tractable. Handled responsibly, a UTV transports riders with little fuss or fanfare into many backcountry areas, and as long as riders are willing to respect habitat and keep to established roads and trails, an UTV doesn't appreciably damage terrain or ecosystems. I'll never love four rubber wheels bolted to a motor the way I love four iron-shod hooves, a soft muzzle, and deep, knowing eyes, but as I've aged, my practical self has come to balance my ideological side. As an outdoor writer, I've been exposed to various UTVs from many manufacturers and successfully used them for access and meat packing through some heinous conditions. Without doubt, side-by-side rigs have burgeoned in popularity, and I've ridden in some that rival a limousine in size and comfort. Trouble is, such UTVs are — to my mind — just open-air pickup trucks rigged for off-road use, without the benefit of heating and air-conditioning. Maneuverability and practicality are left behind. Which brings us to Honda's Pioneer 500. Late spring of 2015 found me with a premium public-land elk tag in hand — one that took me 17 years to draw — and the need for a compact, hardy UTV for scouting, running trail cameras all summer, and hunting when the time came. Presuming that I might need to pack meat on it and knowing that my brother would be accompanying me, I didn't want a traditional four-wheeler, yet neither did I want a big, heavy side-by-side that wouldn't fit on established four-wheeler trails or in the back of my pickup. While reading the premiere issue of Wheels Afield magazine, a blurb on the Pioneer 500 caught my attention. At 50 inches in width, the Pioneer 500 is only a couple of inches wider than a standard full-size four-wheeler, and with its double-wishbone-type suspension with almost six inches of travel front and rear, it has the narrowness and rock-traversing ability necessary to navigate backcountry ATV trails in Utah's rugged, rocky terrain. It's small enough to fit in the back of my Dodge 1500 Ram bed and to park in a corner of the garage, yet it comfortably carries two adults in the seat-belt-equipped front seats (and a kid in-between if necessary). Best of all, at $8,499 (base) it's priced considerably lower than most competing models. In length, the Pioneer 500 is 102.5 inches (8.5 feet). In comparison, a Honda Foreman 4x4 quad is almost 83 inches long or not quite seven feet. When in the back of a standard 6.5-foot pickup bed, the rear tires of the Pioneer 500 extend toward the inside edge of the tailgate. So, yes, it's a bit longer than a full-size quad, but still pickup haulable. Robust roll bars protect riders should the rig turn over, and a continuation of the protective steel tubing skirts the outlines of the front end, offering further protection. At the rear, a 1.25-inch receiver-type hitch enables easy towing setup, and the Pioneer 500 is rated to pull 1,000 pounds — plenty for backcountry camping and hunting. The front end has an open differential to aid smooth, easy steering, while the locked rear axle and independent suspension provides good traction. Intriguingly, the Pioneer 500 has what is termed an "inboard-mounted disc brake." The disc brake provides superior stopping ability — while the inboard-mounted part protects them from excessive dust, mud, and debris. At the rear, a steel cargo rack is rated to carry 450 pounds, and should its flat, side-less design leave you wanting, Honda offers several accessories that turn it into a truck box or a diminutive pickup bed. Once I had mine, I ran around with it for a couple of days and promptly ordered a cargo tray ($500) to more securely hold backpacks, coolers, and elk quarters. Literally dozens of other accessories are available, ranging from side mirrors, to horns, to rack lights, to skid plates, winches, and snowplows. The unit I obtained came fitted with skid plate ($400), a hard roof ($360), and windscreen ($400). Interestingly, the Pioneer 500 has doors with integrated mesh nets — an advantage to parents like me but potentially a disadvantage to Texans that want the freedom to shoot at coyotes in a field. Not that you can't thread a rifle barrel past the netting and shoot (where legal, of course); you just don't have a big range of movement. The cab is equipped with a digital multiple- function screen that displays odometer, speed in mph, gear selection, 4x4 engagement, and fuel level. A 4x4 shift lever protrudes from the dash to the right of the steering wheel, making for easy transitions in and out of four-wheel-drive, and a sturdy parking brake is found off the front of the bench seat. Unlike most quads, with their variable-speed transmissions, the Pioneer 500 is fit with paddle shifters that control a clutchless five-speed transmission. Located one on each side of the wheel, they give the driver better control of the motor and speed of the vehicle. Shifting is easy and done on the fly — no clutch manipulation required. To shift up, pull on the right-side paddle. Down, pull on the left-side paddle. At the bottom end of the range of gears, the vehicle will go into neutral. To shift into reverse, pull a tab in the dash and pop that left-side paddle one more time. At first I wasn't sure I'd like the paddle shifters. That lasted about 100 yards after I pulled onto a sandy two-track and turned the Pioneer 500 loose. Combined with the power steering and disc brakes, the paddles make a guy feel like a Baja racer. It's amazing how much more control and acceleration they provide. Plus, on steep downhill grades, the driver can shift down and use the engine to take stress off the brakes. The paddle shifters control a transmission made of robust steel gears, not belts. My beef with the Pioneer 500 is that it's geared low so that topping 30 mph makes the motor really roar, and while it will go faster, it just feels better to keep it under 30. I'd like to see an overdrive-type sixth gear that would allow drivers to hit 40 or 45 mph at low RPMs for covering distance on good safe roads. For best performance under a variety of conditions, including extreme cold and high-elevation use, the Pioneer 500 uses a 475cc liquid-cooled four-stroke motor with closed-loop fuel injection — a system that benefits fuel mileage. The motor itself is a compact overhead-valve semi-dry-sump design with a short top-to-bottom profile, enabling Honda engineers to lower the Pioneer 500's center of gravity while maintaining high ground clearance. As for power, the crankshaft is oriented front to back, driving power straight to the wheels without any loss due to right-angle drive-train transfers. Surprisingly, fuel capacity is only 3.96 gallons. However, I've pushed the Pioneer 500 up very steep, high-elevation roads, run long stretches of gravel roads, worked around camp, and done it all over again without ever running the tank below half full as the compact side-by-side gets exceptional fuel mileage. With a curb weight — all standard equipment, fluids, and full fuel tank — of 1,010 pounds, the Pioneer 500 is right on the cusp of what I'm comfortable hauling in my half-ton 1500 Ram pickup. It loads comfortably and doesn't compress the springs quite to the overload leaf, and the truck drives surprisingly well with the UTV loaded. Still, with it loaded I won't take the truck off-roading beyond a good gravel road — something that isn't a problem with a 570-pound Honda Rancher aboard, for instance. Of course, neither rig would be an issue in a three-quarter-ton pickup. Tires are standard full-size four-wheeler rubber: 24x8-12 in front, 24x10-12 at rear.As for color, the Pioneer 500 can be had in classic Honda red, a nice dark olive green, a superb yellow that I'd describe as nearly as appealing as Corvette yellow, and Honda Phantom Camo. Considering the vehicle's intended purpose, the test unit came in camo, though I highly considered the yellow. Although the motor isn't any bigger than that of heavy-duty quads, the Pioneer 500 has plenty of pep. Downshift, crank the wheel, and hammer the accelerator — you'll be impressed with the torq. You don't have to hang off the side to keep it stable; the suspension has a tight, sporty feel yet is engineered to positively flow over rubble and rocks. After familiarizing myself with the Pioneer 500 and satiating my kids' enthusiasm for the recreational ATV trails in my neighborhood, I loaded it into the back of my truck and headed to my hunting unit to do some scouting. This was early June, and I'd already set several trail cameras deep in wilderness country. Glassing mornings and evenings, I spent two days tending the cameras, running as close as ethical on established two-tracks before hiking the rest of the way in to check cameras. One area in particular required a two-and-a-quarter-mile climb up a neglected forest service road renowned for its rocky nature. From the starting point to where I typically began hiking, the road climbs at least 2,000 feet. On horseback, it takes a solid hour. On a four-wheeler, I've done it in 30 minutes, but I stepped off with buzzing arms and a sense of profound relief. Driving the Pioneer 500 hard, I made it to the top in just less than 20 minutes, as fresh as when I stepped in. Through rain, wind, heat, and excessive dust, the Pioneer 500 worked hard all summer, putting miles on while scouting for my hunt. I trucked it back and forth from my home to my hunt area several times, and when it came time to hunt, it stood in camp ready for meat-hauling duty. As it turned out, I shot a big bull in a roadless wilderness area, and we hauled it out with my brother's horses. It's still true: There are some things that horses are just better at than machines. However, after working the Pioneer 500 hard over a long summer of scouting, I'll cheerfully argue that where an all-around, practical UTV is called for, none will better this one. It's compact, reliable, and capable. Could I have gotten that big bull elk without it? Probably, but it would have been a lot less fun and would have resulted in a lot more wear and tear on this middle-aged body.